A combination of the best ingredients available on the market today to further entice your feathered friends in a continuing effort to enhance their immune systems. A healthy choice to start their day when you want the very best in quality natural nutrition. Scrambled eggs, tofu, okra, collard greens and cheddar cheese are just a sample of the new ingredients in our new mix. No additives or preservatives, only natural ingredients. 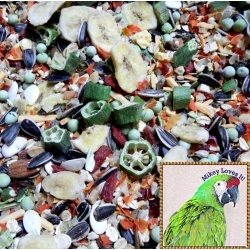 Your birds will be "beak smackin" all morning and its just as simple to prepare as our other mixes. 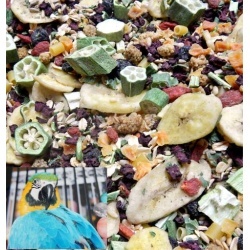 Easy and nutritious, leaving you time to enjoy your feathered friends!! If Mikey likes it, its a winner!! A hearty breakfast meal or any time of the day warm meal. Directions: Add equal parts mix to boiling water, cover and let steep for approx. 10-15 minutes or until liquid is absorbed, cool and serve warm. Ingredients: Carrots, Rolled Oats, Rye Seeds, Whole Pumpkin Seeds, Banana Chips, Freeze Dried Cheddar Cheese, Freeze Dried Tofu, Chopped Nuts Without Peanuts, Freeze Dried Scrambled Eggs, Freeze Dried Okra, Red and Green Bell Peppers, Goji Berries, Dates, Organic Sunflower Kernels, White Potato, Freeze Dried Peas, Whole Almonds, Organic Hulled Barley, Organic Whole Sunflower Seeds, Organic Hulled Millet and Cinnamon Chips. Ingredients: Carrots, Rolled Oats, Rye Seeds, Pumpkin Seeds, Banana Chips, Freeze Dried Cheddar Cheese, Freeze Dried Tofu, Chopped Nuts Without Peanuts, Freeze Dried Scrambled Eggs, Freeze Dried Okra, Red and Green Bell Peppers, Goji Berries, Dates, Organic Sunflower Kernels, White Potato, Freeze Dried Peas, Whole Almonds, Organic Hulled Barley, Organic Whole Sunflower Seeds, Organic Hulled Millet, Cinnamon Chips and Small Pasta. Fiesta Brunch is a colorful combination of the best freeze dried and dehydrated ingredients of essential dietary components for building a healthy and strong immune system. Our Fiesta Afternoon Brunch (FAB) is rich in calcium, omega-3 fatty acids, vitamin A and protein. 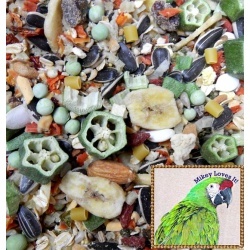 Calcium is a very important component to all bird diets and should be provided in abundance. Many of the calcium rich ingredients are also high in Vitamin A.
Omega-3 fatty acids are the key building blocks for every cell in the body and are also important for the assimilation of fat-soluble vitamins. These are the vitamins that cannot be absorbed properly without essential fatty acids. 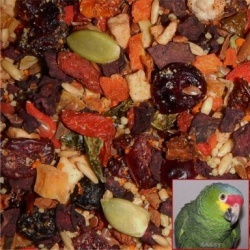 Vitamin A is essential for your bird’s continuing health. Beta-carotene is a red/orange pigment found in fruits and plants, and it is the precursor to this important vitamin. Once consumed, the liver turns the beta-carotene into vitamin A and stores it for future use. The darker the flesh of the vegetable or fruit, the higher beta-carotene content. Vegetables can be fed raw but are sometimes more digestible if lightly steamed. 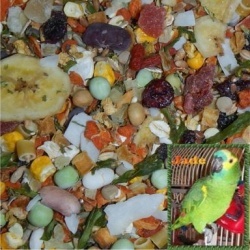 Proteins are the building blocks of every cell in our birdies bodies and the only way to acquire many of the amino acids needed is through diet. 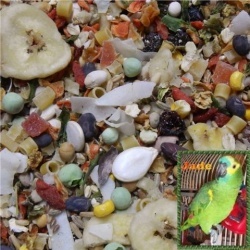 All ingredients in the FAB mix were chosen because they provide the essential dietary components of high nutritional value for your feathered friend. No additives or preservatives, only premium human grade ingredients. Simple to prepare and easy nutrition for you to provide. FAB has been a huge hit here! Feces may turn pink to red because of the colors of veggies being used. Directions: Add equal parts mix to boiling water, cover and let steep for approx. 10-15 minutes or until liquid is absorbed or drain off any excess water. Cool for a few minutes and serve. One tablespoon per bird should be plenty for an afternoon or anytime warm snack. Ingredients: Tri-Colored Couscous, Carrots, Beets, Organic Flax, Blueberries, Cranberries, Apples, Organic Oat Groats, Goji Berries, Pumpkin Kernels, Sweet Potato, Cinnamon Chips, Tomato Flakes, Red and Green Bell Peppers. This mix will give your fid the power boost it needs. A specific combination of freeze dried and dehydrated ingredients without preservatives, additives, salt or sulfur added. As always, combining the highest quality of vegetables, fruits, grains, pasta and herbs all in one package. Just one more option for when you can't get out to shop. No more cutting, dicing or chopping. Everything in one bag for those times when you need a fast nutritious meal for your babies. Ingredients will last indefinitely when stored in a cool area. Directions: Add equal amounts of mix to boiling water, steep for approx. 10-15 minutes, or until liquid is partially to fully absorbed, cool and serve warm. We have included a tablespoon of our Herbal Supreme in the mix for the ultimate meal!! Ingredients: Beets, Freeze Dried Okra, Kale, Blueberries, Sweet Potato, Goji Berries, Organic Hulled Barley, Organic Oat Groats, Mulberries, Rye Seeds, Banana Chips, Rolled Oats, Small Pasta, Rosemary, Thyme, Savory, Fennel Seeds, Basil, Lavender and Marjoram. A specific combination of freeze dried and dehydrated ingredients without preservatives, additives, salt or sulfur added. As always, combining the highest quality of vegetables, beans, fruits, grains, pasta, seeds and herbs all in one package. Just one more option for when you can't get out to shop. No more cutting, dicing or chopping. Everything in one bag for those times when you need a fast nutritious meal for your babies. Ingredients will last indefinitely when stored in a cool area. Keep in mind that ingredients double and triple in amounts when rehydrated. Ingredients: Carrots, White Beans, Kidney Beans, Sweet Potato, Papaya, Goji Berries, Organic Hulled Barley, Zucchini, Black Beans, Pineapple, Raisins, Organic Flax Seed, Red and Green Bell Peppers, Dried Broccoli, Freeze Dried Corn, Organic Oat Groats, Pumpkin Seeds, Cranberries, Rye Seeds, Green Beans, White Potato, Banana Chips, Mango, Shredded Coconut, Organic Red Wheat, Rolled Oats, Freeze Dried Peas, Freeze Dried Lentils, Split Green Peas, Soy Nuts and Small Pasta. Herb Ingredients: Alfalfa Leaf, Parsley Flakes, Flax Seed, Bee Pollen, Chickweed, Dandelion Leaf, Red Clover Blossoms and Leaf, Red Raspberry Leaf, Rosehips, Milk Thistle, Ginger Root Powder, Barley Grass Powder, Dill Weed, Dulse Leaf, Garlic, Wheat Grass Powder, Astragalus Powder, Chili Flakes, Cinnamon Powder and Turmeric Powder. A specific combination of freeze dried, and dehydrated ingredients without preservatives, additives, salt or sulfur added. As always, combining the highest quality of vegetables, beans, fruits, grains, pasta, seeds and herbs all in one package. Just one more option for when you can't get out to shop. No more cutting, dicing or chopping. Everything in one bag for those times when you need a fast nutritious meal for your babies. Ingredients will last indefinitely when stored in a cool area. Keep in mind that ingredients double and triple in amounts when rehydrated. Ingredients: Carrots, White Beans, Kidney Beans, Sweet Potato, Papaya, Goji Berries, Cranberries, Organic Hulled Barley, Zucchini, Black Beans, Pineapple, Raisins, Organic Flax Seed, Dry Roasted Soybeans, Roasted Peanuts, Red and Green Bell Peppers, Dried Broccoli, Freeze Dried Corn, Organic Oat Groats, Pumpkin Seeds, Rye Seeds, Green Beans, White Potato, Banana Chips, Mango, Shredded Coconut, Organic Red Wheat, Rolled Oats, Freeze Dried Peas, Freeze Dried Lentils, Split Green Peas, Soy Nuts and Small Pasta. Herbs included: Alfalfa Leaf, Parsley Flakes, Flax Seed, Bee Pollen, Chickweed, Dandelion Leaf, Red Clover Blossoms and Leaf, Red Raspberry Leaf, Rosehips, Milk Thistle, Ginger Root Powder, Barley Grass Powder, Dill Weed, Dulse Leaf, Garlic, Wheat Grass Powder, Astragalus Powder, Chili Flakes, Cinnamon and Turmeric Powder.